As the 8-day holiday of Hanukkah approaches, Israel marks the eighth day of Operation Pillar of Defense by counting the missiles fired. Gaza’s ruling Hamas terrorists and affiliated terrorist groups have fired 1,408 missiles and rockets at Israel since the beginning of Operation Pillar of Defense, eight days ago. Of those fired, 56 missiles have struck populated areas in Israel, and 412 have been intercepted and shot down by the Iron Dome anti-missile defense system. A CNN poll showed a considerable gap between Republicans and Democrats when it comes to backing Israel in the current Gaza conflict. In the CNN poll published Monday, respondents were asked whether “Israel was justified or unjustified in taking military action against Hamas and the Palestinians in the area known as Gaza.” Among Democrats, 40 percent said Israel was “justified,” compared to 74 percent of Republicans and 59 percent of independents. PRIME MINISTER NETANYAHU:I want to welcome Secretary Clinton once again to Jerusalem. I want to thank President Obama, you, and the American Government and people for their strong support for Israel in this hour of need. I want to also thank you especially for your support of Iron Dome that’s been saving lives, and we are in a battle to save lives.One of the things that we’re doing is trying to resist and counter a terrorist barrage which is aimed directly at our civilians, and doing so by minimizing civilian casualties, whereas the terrorist enemies of Israel are doing everything in their power to maximize the number of civilian casualties. Obviously, no country can tolerate a wanton attack on its civilians. Now, if there is a possibility of achieving a long-term solution to this problem through diplomatic means, we prefer that. But if not, I am sure you understand that Israel will have to take whatever action is necessary to defend its people. This is something that I don’t have to explain to Americans. I know that President Obama, you, and the American people understand that perfectly well. And I thank you once again for your support. Welcome to Jerusalem. SECRETARY CLINTON: Thank you very much, Prime Minister. I look forward to a productive discussion this evening at such a critical moment for Israel and the region. President Obama asked me to come to Israel with a very clear message: America’s commitment to Israel’s security is rock solid and unwavering. That is why we believe it is essential to de-escalate the situation in Gaza. 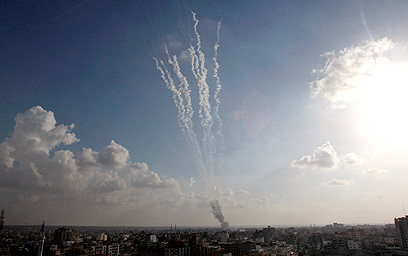 The rocket attacks from terrorist organizations inside Gaza on Israeli cities and towns must end and a broader calm restored. The goal must be a durable outcome that promotes regional stability and advances the security and legitimate aspirations of Israelis and Palestinians alike. President Obama has emphasized these same points in his multiple conversations with President Morsi of Egypt, and we appreciate President Morsi’s personal leadership and Egypt’s efforts thus far. As a regional leader and neighbor, Egypt has the opportunity and responsibility to continue playing a crucial and constructive role in this process. I will carry this message to Cairo tomorrow. I will also be consulting with President Abbas in Ramallah. Let me also say, to echo the Prime Minister, I am very pleased that the Iron Dome defense system is performing so well. Our partnership in support of this system represents America’s enduring commitment to the safety and security of the Israeli people and to Israel’s right to defend itself. But no defense is perfect and our hearts break for the loss of every civilian – Israeli and Palestinian – and for all those who have been wounded or who are living in fear and danger. I know today was a difficult day, and I offer my deepest condolences to the loved ones of those who were lost and injured. In the end, there is no substitute for security and for a just and lasting peace, and the current crisis certainly focuses us on the urgency of this broader goal. So in the days ahead, the United States will work with our partners here in Israel and across the region toward an outcome that bolsters security for the people of Israel, improves conditions for the people of Gaza, and moves toward a comprehensive peace for all people of the region. And I thank you, Prime Minister, for your hospitality and look forward to our discussion. Makoto Otsuka, director general of the Holocaust Education Center in Fukuyama, Japan, with visiting schoolchildren in front of a photo of Anne Frank. An Israeli soldier and an Israeli civilian were killed in separate rocket attacks from the Gaza Strip…. More than 140 rockets were fired at southern Israel in the seventh day since the beginning of the operation, including two aimed at Jerusalem. Some 56,000 military reservists have been called up since the beginning of the operation.